In December of 1988 through April of 1989, a young physicist named Bob Lazar worked at a Government research facility in the Nevada desert known as S4. This facility was part of the Area 51 complex and about 15 miles south of it. The whole story is far too long to get into here, but his job at S4 was to "back engineer" a recovered spacecraft of alien origin (see boblazar.com for additional info). Once Bob went public with the information, John Andrews of the Testors Model Corporation (Testors was the premier model company for producing accurate models of all Military craft) contacted Bob and offered his services to produce an accurate reproduction of the craft. At the time, Bob still had the flight test schedule which he gave to Andrews. After a lot of leg work, Andrews managed to get a Russian satellite company to photograph the test area at the time & date that Bob specified (American satellite companies refused to take the images). The background of the poster is the actual image taken by the Russian satellite - showing the craft in flight over the S4 area. 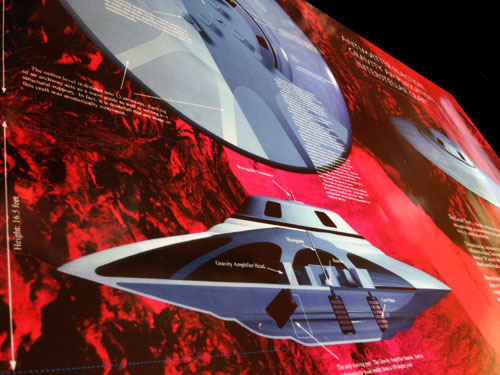 The craft can be seen hovering just below the mountain range in the center of the poster. 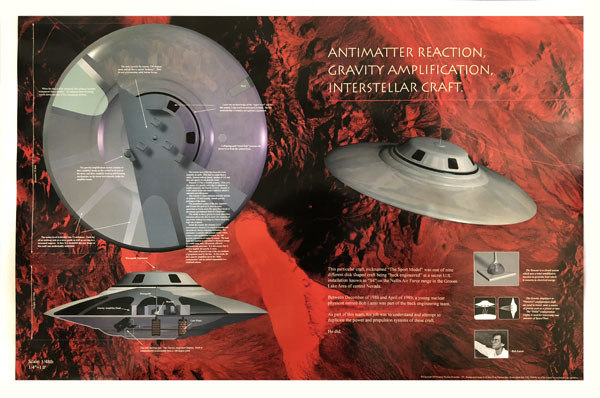 The poster has 3 views of the craft as well as a cut-away showing the internal components and functions. Hollywood special effects artist John Farhat took the satellite images, drawings, and other info and created this poster. These are newly printed posters on 100 pound, high gloss poster stock. The graphics, color & overall quality is far better than the original printing run done many years ago. The posters measure 24" x 36"
The poster can be autographed by Bob if requested (no additional charge).